Jimmy Carter was the 39th President of the United States and continues to be a leader in international affairs. 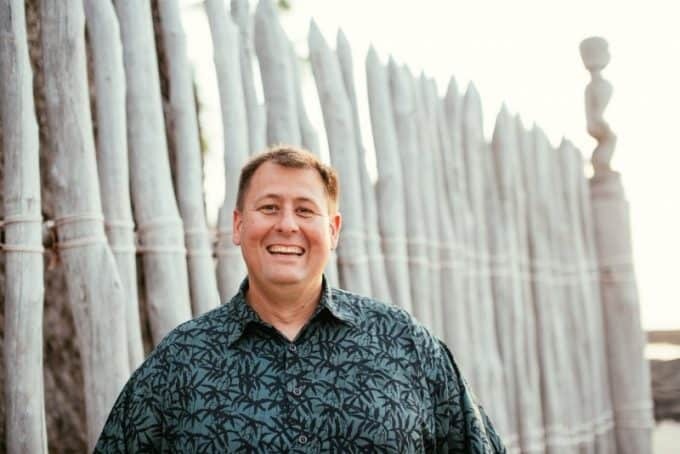 He grew up in the town of Plains, Georgia and had his election headquarters at the local train depot. 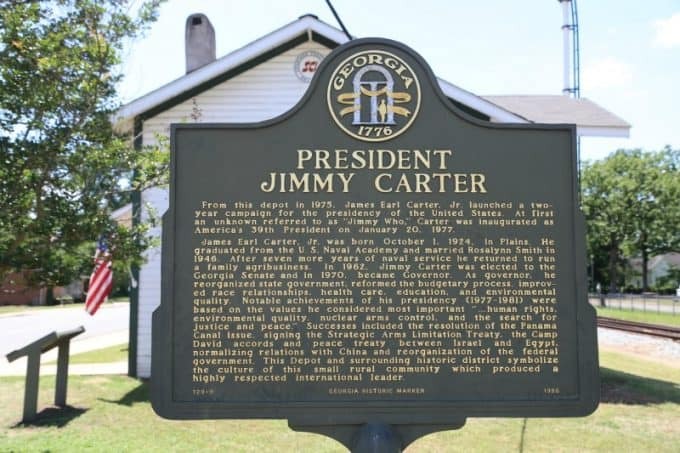 The Jimmy Carter National Historic Site is dedicated to celebrating the life and work of Jimmy Carter. One of the cool things about this site is you have the potential to meet Mr. Carter during your visit. 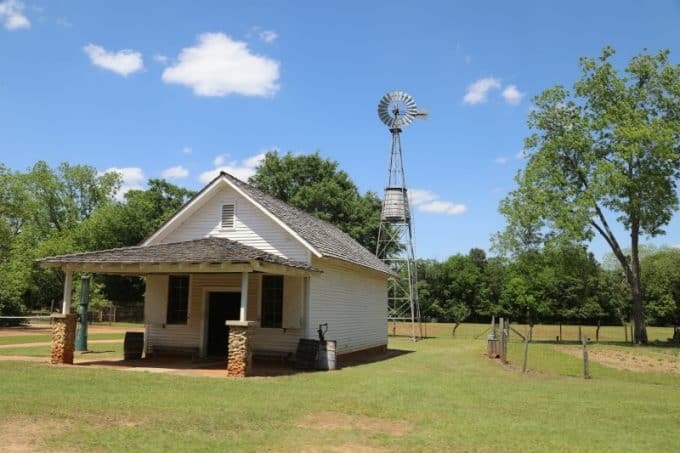 The Carters still live in Plains, Georgia and teach Sunday school every weekend. Mr. Carter hosts book signings at the visitor center. 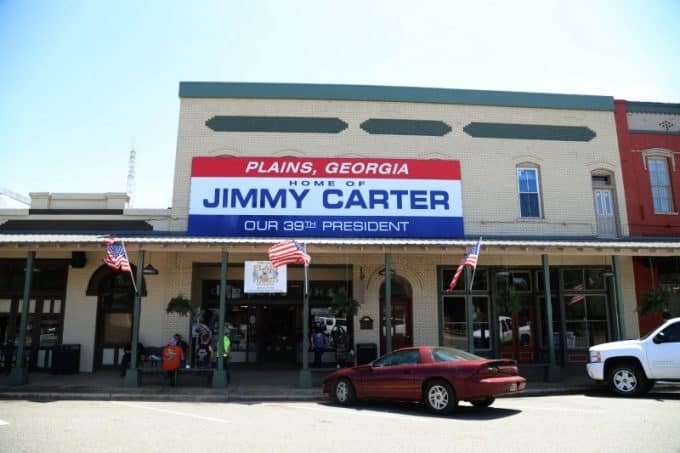 The town of Plains, Georgia may not be big in size but it is big in heart and pride for Mr. Carter. You can’t miss the love that the town has for Mr. Carter and what he has brought to the city. Give yourself at least a couple of hours to explore the historic site and town during your visit. 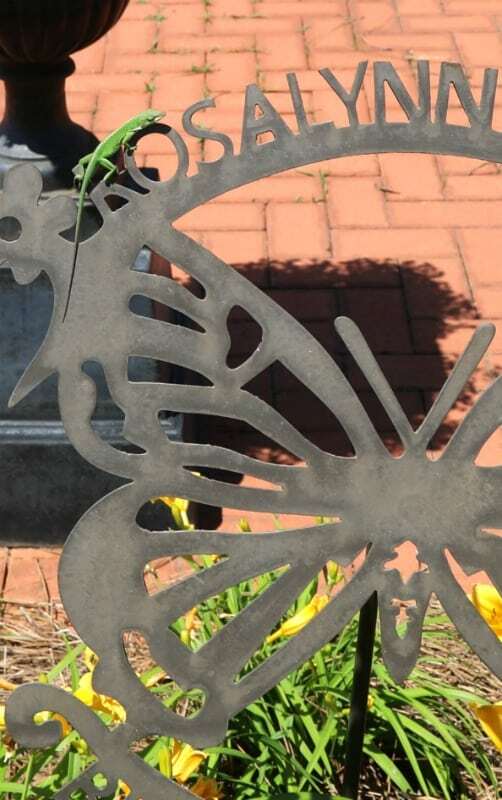 Make sure and try the local peanut butter ice cream and watch the butterflies in the Rosalynn Carter Butterfly Trail. 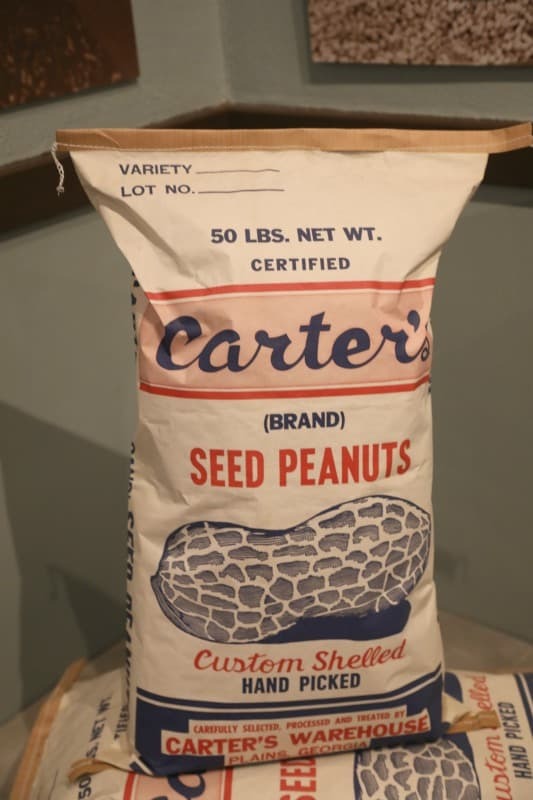 The visitor center is the perfect place to start your visit to the Jimmy Carter National Historic Site. The visitor center houses a museum, exhibits, maps of the area, video, and bookstore. Learn more about Jimmy Carter growing up in Plains, what life was like on the farm, the importance of teacher Miss Julia L. Coleman in Jimmy and Rosalynn Carter’s Life and so much more. Also, find out when Mr. Carter will be at the visitor center signing books and attending events. 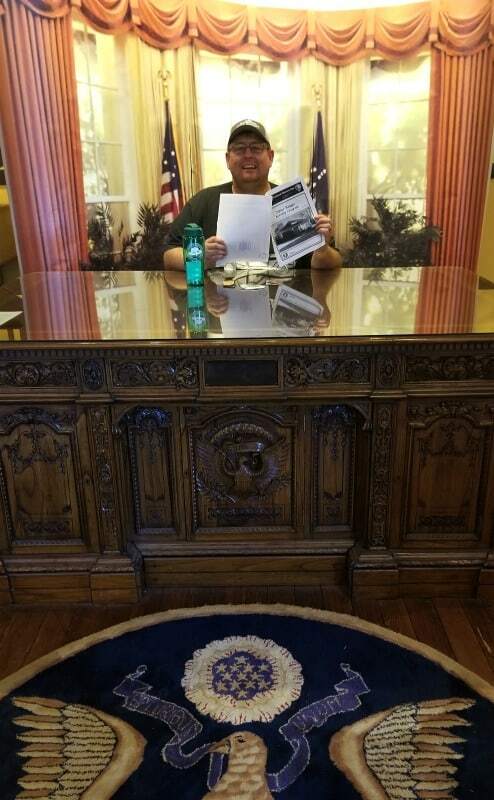 Have you ever wanted to feel presidential? 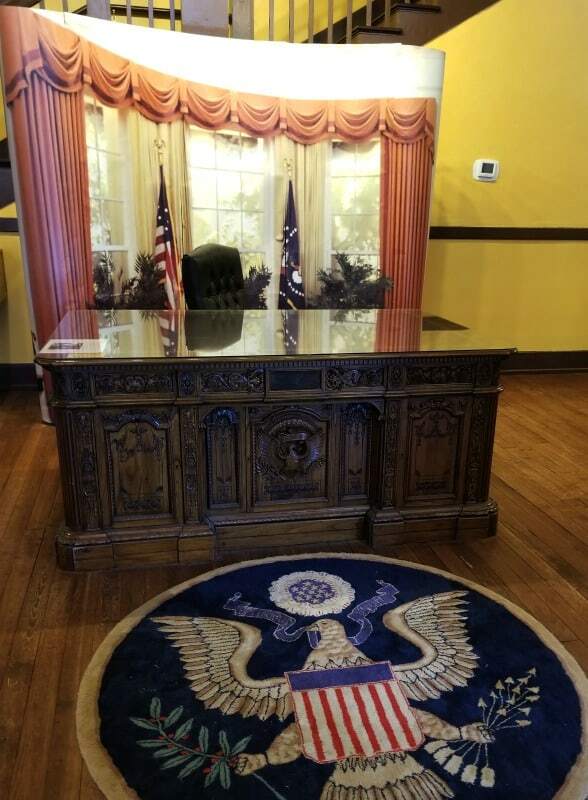 You can have your chance to sit in the Oval Office and make proclamations all day long if you like at the Jimmy Carter National Historic Site. 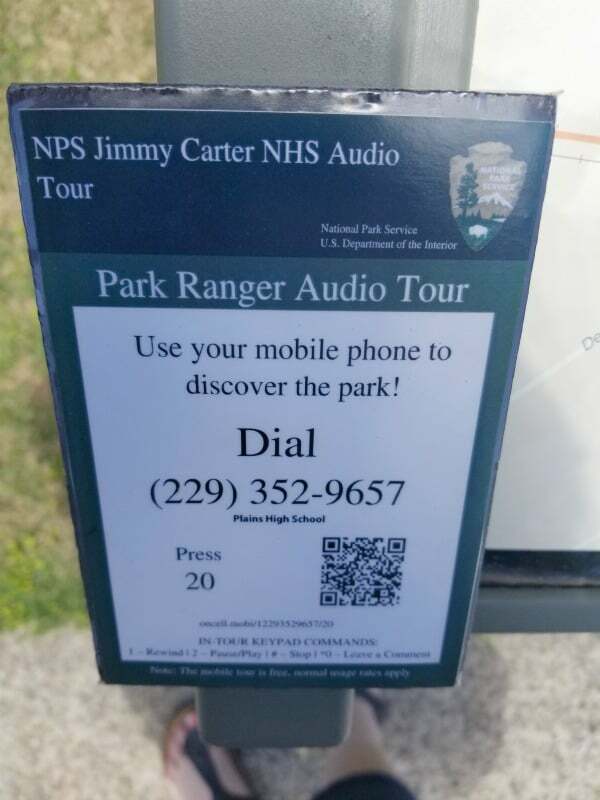 The Junior Ranger program is great at this site! 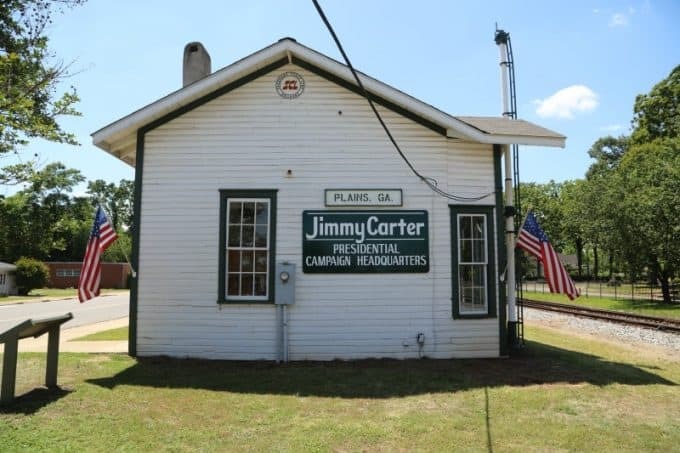 You have the chance to learn a ton about Jimmy Carter and the site plus they have quite the package for Junior Rangers. It will take at least 30 minutes in the museum and visitor center along with a trip to the farm to complete the Junior Ranger Book. The rangers on site were great about helping to point us in the right direction to find answers and make sure we knew what we were looking for. 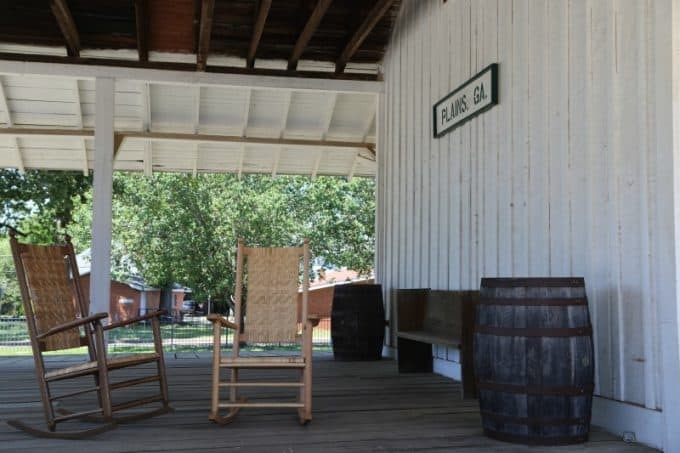 Plains Depot is located in the heart of Plains, Georgia on the main street. You have the opportunity to see the depot which was completed in 1888. 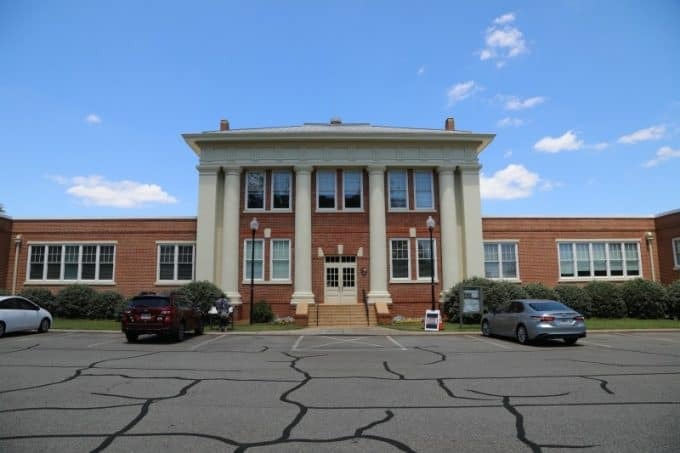 The current building was restored to its 1976 appearance as Jimmy Carter’s campaign headquarters. While visiting the park one of the Park Rangers told us that he feels that the farm is one of the most important stops we could make during our visit. He reminded us that not so long ago our relatives were living without electricity and working on farms just like this one. Two generations back from us had a much different life from our cell phones and constantly being connected. 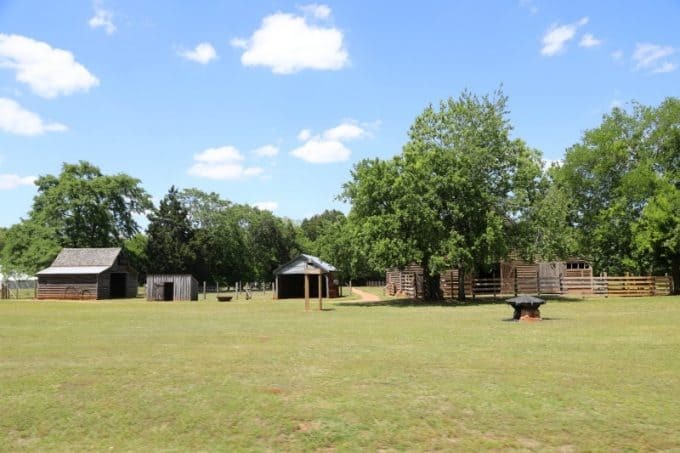 Ranger-led tours are available on Saturday and Sundays at 11:30 a.m. and 3:00 p.m. and start in front of the comfort station at the Jimmy Carter Boyhood Farm. The talks are weather permitting so stop by the visitor center to confirm the times. 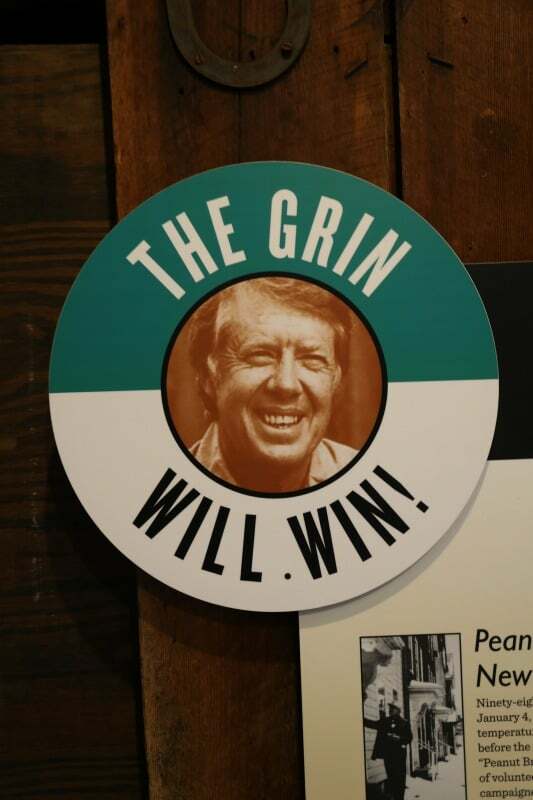 Located a 1/2 mile down the street from the visitor center the giant 13-foot smiling peanut was originally created for a 1976 visit by Jimmy Carter. 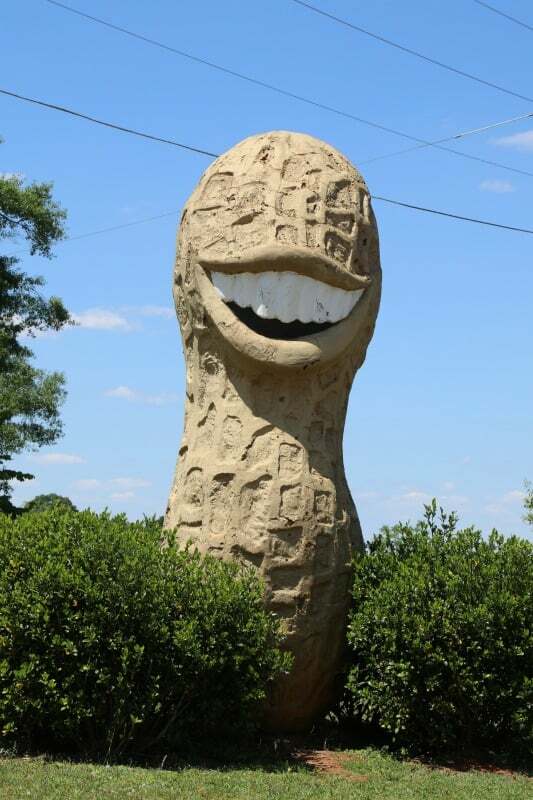 The giant smiling peanut has gone through a few different restorations and is now sitting in the gas station parking lot smiling at residents and visitors alike. 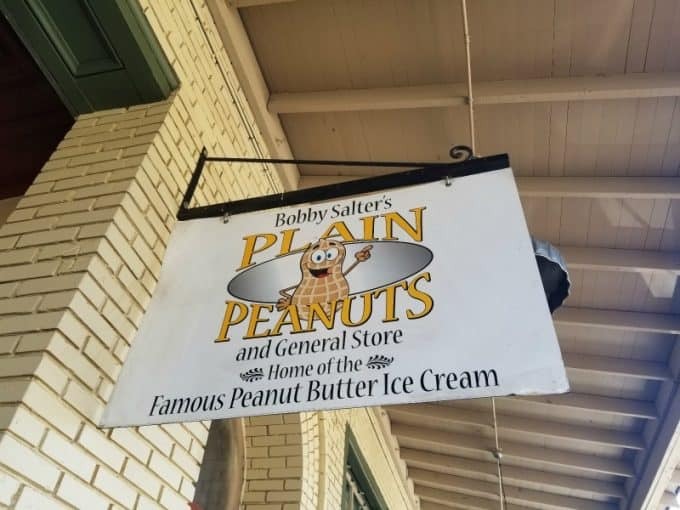 When in Plains you have to try the world famous peanut butter ice cream at Plain Peanuts and General Store. They offer delicious samples when you enter the store of the ice cream and boiled peanuts. After one sample trust me you are going to want a cup of this delicious ice cream, especially on a hot Georgia afternoon. 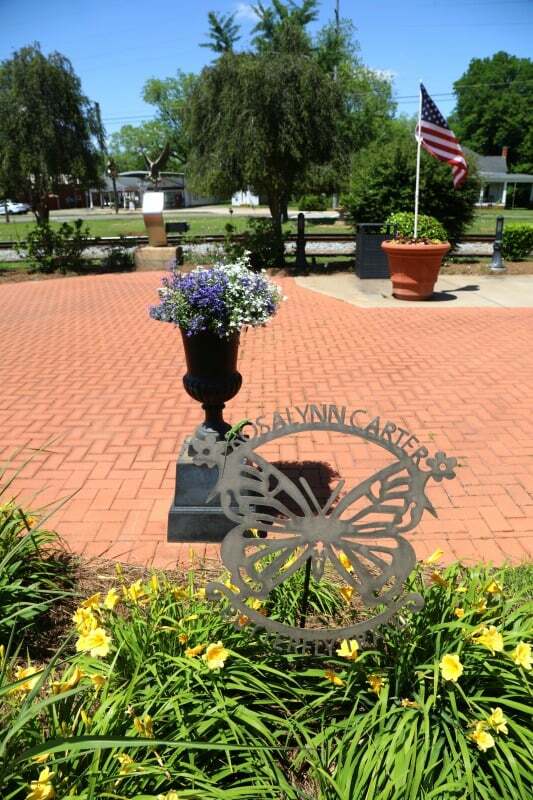 Located on the main street of Plains, Georgia the Rosalynn Carter Butterfly Trail was created to help encourage the conservation of butterflies. The Carter’s have donated their current residence and compound to the National Park Service so it is protected. The home and grounds are not open to the public as the Carter’s still live here. The Carter’s purchased this 2.4-acre lot in 1960 and built their ranch home here. This is the only home they have ever owned. The Rosalynn Carter Butterfly Trail was established by Annette Wise with the Georgia Department of Education in April 2013. While we were there we had the chance to see birds, lizards, and multiple butterflies. This is a great area to enjoy your peanut butter ice cream cone. Closed on Thanksgiving, Christmas and New Years Day.